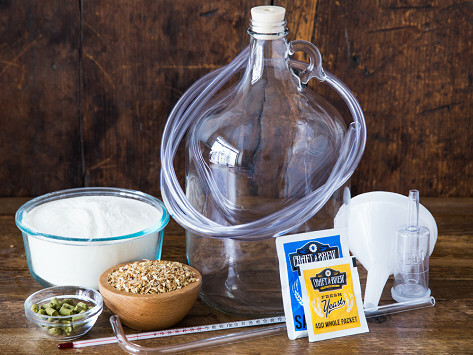 Craft a Brew is a DIY home beer brewing kit that will make outstanding craft beer right out of the box. It is designed to allow customers to make the best possible beer in their own kitchen on their first attempt. The premium brewing kits use only 100% malt extract, world-class specialty grains, fresh hops, and high-quality yeast: everything you need to create great tasting beer. Dimensions (in packaging): 13" x 10" x 10"
First, I love shopping with the Grommet, and all they support. I purchased this set of BBQ utensils for a gift. The receiver said they loved loved them and would get many year of cooking with them. My husband had been talking about brewing his own beer for a few years now. I've looked at many kits online, but when I saw this kit, I knew it was PERFECT! My husband absolutely loves it! It's such a high quality kit! We will be using this for years to come! Beer and wine lovers, Kyle Westfall wants to turn you into crafters. His DIY kits contain just about everything you need to make outstanding craft beer or wine in the comfort of your own kitchen. After trying many home brewing kits, Kyle wanted to raise the bar. His goal was to create a kit that gave results like professional craft brewers at an accessible price. After two years of home brewing, followed by months of recipe testing and refining, Craft a Brew was born. From there, it was an obvious extension to help wine enthusiasts make their own vintages, too. Designed to let you make the best possible beer right out of the box, the premium brewing kits use only 100% malt extract, world-class specialty grains, fresh hops, and high-quality yeast. All of the tools are included, too (except empty bottles), so you can get to crafting right away. The wine kits are based on the same philosophy—great ingredients, reliable equipment, and ease of use. Whether you opt for a brew or vino kit (or both), in a short time you'll be enjoying the fruits of your labor.